This article is about a type of historical building. For other uses, see Manor house (disambiguation). A manor house was historically the main residence of the lord of the manor. The house formed the administrative centre of a manor in the European feudal system; within its great hall were held the lord's manorial courts, communal meals with manorial tenants and great banquets. The term is today loosely applied to various country houses, frequently dating from the late medieval era, which formerly housed the gentry. 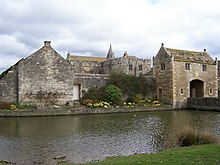 The lord of the manor may have held several properties within a county or, for example in the case of a feudal baron, spread across a kingdom, which he occupied only on occasional visits. Even so, the business of the manor required to be directed and controlled by regular manorial courts, which appointed manorial officials such as the bailiff, granted copyhold leases to tenants, resolved disputes between manorial tenants and administered justice in general. A large and suitable building was required within the manor for such purpose, generally in the form of a great hall, and a solar might be attached to form accommodation for the lord. Furthermore, the produce of a small manor might be insufficient to feed a lord and his large family for a full year, and thus he would spend only a few months at each manor and move on to another where stores had been laid up. This also gave the opportunity for the vacated manor house to be cleaned, especially important in the days of the cess-pit, and repaired. Thus such non-resident lords needed to appoint a steward or seneschal to act as their deputy in such matters and to preside at the manorial courts of his different manorial properties. The day-to-day administration was carried out by a resident official in authority at each manor, who in England was called a bailiff, or reeve. Although not typically built with strong fortifications as were castles, many manor-houses were fortified, which required a royal licence to crenellate. They were often enclosed within walls or ditches which often also included agricultural buildings. Arranged for defence against roaming bands of robbers and thieves, in days long before police, they were often surrounded by a moat with a drawbridge, and were equipped with gatehouses and watchtowers, but not, as for castles, with a keep, large towers or lofty curtain walls designed to withstand a siege. The primary feature of the manor house was its great hall, to which subsidiary apartments were added as the lessening of feudal warfare permitted more peaceful domestic life. By the beginning of the 16th century, manor houses as well as small castles began to acquire the character and amenities of the residences of country gentlemen, and many defensive elements were dispensed with, for example Sutton Place in Surrey, circa 1521. A late 16th-century transformation produced many of the smaller Renaissance châteaux of France and the numerous country mansions of the Elizabethan and Jacobean styles in England. Before around 1600, larger houses were usually fortified, generally for true defensive purposes but increasingly, as the kingdom became internally more peaceable after the Wars of the Roses, as a form of status-symbol, reflecting the position of their owners as having been worthy to receive royal licence to crenellate. The Tudor period (16th century) of stability in England saw the building of the first of the unfortified great houses, for example Sutton Place in Surrey, circa 1521. The Dissolution of the Monasteries under King Henry VIII resulted in many former monastical properties being sold to the King's favourites, who then converted them into private country houses, examples being Woburn Abbey, Forde Abbey, Nostell Priory and many other mansions with the suffix Abbey or Priory to their name. During the second half of the reign of Queen Elizabeth I (1558–1603) and under her successor King James I (1603–1625) the first mansions designed by architects not by mere masons or builders, began to make their appearance. Such houses as Burghley House, Longleat House, and Hatfield House are among the best known of this period and seem today to epitomise the English country house. "This Nutwell Court, which signifies a mansion-house in a signiory, came to the family of Prideaux". Manor houses, although mostly forming residences for the lords of the manors on which they were situated, were not historically named with the suffix "Manor", as were many grand country houses built in the 19th century, such as Hughenden Manor or Waddesdon Manor. The usage is often a modern catch-all suffix for an old house on an estate, true manor or not. The German equivalent of a manor house is a Gutshaus (or Gut, Gutshof, Rittergut, Landgut or Bauerngut). Also Herrenhaus and Domäne are common terms. Schloss (pl. Schlösser) is another German word for a building similar to manor house, stately home, château or palace. Other terms used in German are Burg (castle), Festung (fort/fortress) and Palais/Palast (palace). In addition to having both lower and upper halls, many French manor houses also had partly fortified gateways, watchtowers, and enclosing walls that were fitted with arrow or gun loops for added protection. Some larger 16th-century manors, such as the Château de Kerjean in Finistère, Brittany, were even outfitted with ditches and fore-works that included gun platforms for cannons. These defensive arrangements allowed maisons-fortes, and rural manors to be safe from a coup de main perpetrated by an armed band as there was so many during the troubled times of the Hundred Years War and the wars of the Holy League; but it was difficult for them to resist a siege undertaken by a regular army equipped with (siege) engines. During the Dutch Golden Age in the 17th century, merchants and regents looking for ways to spend their wealth bought country estates and built grand new homes, often just for summer use. Some purchased existing manor houses and castles from the nobility. 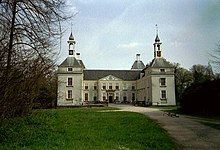 Some country houses were built on top of the ruins of earlier castles that had been destroyed during the Dutch Revolt. The owners, aspiring to noble status, adopted the name of the earlier castle. These country houses or stately homes (called buitenplaats or buitenhuis in Dutch) were located close to the city in picturesque areas with a clean water source. Wealthy families sent their children to the country in the summer because of the putrid canals and diseases in the city. A few still exist, especially along the river Vecht, the river Amstel, the Spaarne in Kennemerland, the river Vliet and in Wassenaar. Some are located near former lakes (now polders) like the Wijkermeer, Watergraafsmeer and the Beemster. In the 19th century, with improvements in water management, new regions came into fashion, such as the Utrecht Hill Ridge (Utrechtse Heuvelrug) and the area around Arnhem. The architectural form of the Polish manor house (Polish: dwór) evolved around the late Polish Renaissance period and continued until the Second World War, which, together with the communist takeover of Poland, spelled the end of the nobility in Poland. A 1944 decree nationalized most mansions as property of the nobles, but few were adapted to other purposes. Many slowly fell into ruin over the next few decades. Poland inherited many German-style manor houses (Gutshäuser) after parts of eastern Germany were taken over by Poland after World War II. Quinta is a term used in the Portuguese language-speaking world, which is applied variously to manors homes or to estates as a whole. 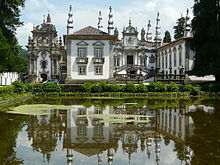 A Palacio is a sumptuously decorated grand residence, especially a royal residence or the home of a head of state or some other high-ranking dignitary, such as a bishop or archbishop. The word itself is derived from the Latin name Palātium, for Palatine Hill, the hill which housed the Imperial residences in Rome. Palacio Real is the same as Palacio, but historically used (either now or in the past) by the Spanish Royal Family. Palacio arzobispal is the same as Palacio, but historically used (either now or in the past) by the ecclesiastic authorities (mainly bishops or archbishops). Palacete is bejewelled and built house as a palace, but smaller. Alcázar is a type of Moorish castle or fortified palace in Spain (and also Portugal) built during Muslim rule, although some founded by Christians. Mostly of the alcázars were built between the 8th and 15th centuries. Many cities in Spain have its alcázar. Palaces built in the Moorish style after the expulsion of the Moors from Spain are often referred to as alcazars as well. Hacienda is landed estates of significant size located in the south of Spain (Andalusia). They were also very common in the former Spanish Colonies. Some haciendas were plantations, mines or factories. Many haciendas combined these productive activities. They were developed as profit-making, economic enterprises linked to regional or international markets. The owner of an hacienda was termed an hacendado or patrón. The work force on haciendas varied, depending on the type of hacienda and where it was located. Quinta is a countryside house closer to the urban core. Initially, "quinta" (fifth) designated the 1/5 part of the production that the lessee (called "quintero") paid to the lessor (owner of the land), but lately the term was applied to the whole property. This term is also very common in the former Spanish Colonies. The Baserri, called "Caserio" in Spanish, is the typical manor house of the Basque Provinces and Navarre. A baserri represents the core unit of traditional Basque society, as the ancestral home of a family. Traditionally, the household is administered by the etxekoandre (lady of the house) and the etxekojaun (master of the house), each with distinctly defined rights, roles and responsibilities. When the couple reaches a certain age upon which they wish to retire, the baserri is formally handed over to a child. Unusually, the parents were by tradition free to choose any child, male or female, firstborn or later born, to assume the role of etxekoandre or etxekojaun to ensure the child most suitable to the role would inherit the ancestral home. The baserri under traditional law (the fueros) cannot be divided or inherited by more than one person. This is still the case in the Southern Basque Country but the introduction of the Napoleonic Code in France, under which such practices are illegal, greatly upset this tradition in the North. Although the Basques in the north chose to be "creative" with the new laws, it overall resulted in the breakup and ultimate financial ruin of many baserris. In practice the tradition of not breaking up baserris meant that the remaining children had to marry into another baserri, stay on the family baserri as unmarried employees or make their own way in the world (Iglesia o mar o casa real, "Church or sea or royal house"). A cortijo is a type of traditional rural habitat in the Southern half of Spain, including all of Andalusia and parts of Extremadura and Castile-La Mancha. Cortijos may have their origins in ancient Roman villas, for the word is derived from the Latin cohorticulum, a diminutive of cohors, meaning 'courtyard'. They are often isolated structures associated with a large family farming or livestock operation in the vast and empty adjoining lands. It would usually include a large house, together with accessory buildings such as workers' quarters, sheds to house livestock, granaries, oil mills, barns and often a wall enclosing a courtyard. The master of the cortijo or "señorito" would usually live with his family in a two-story building, while the accessory structures were for the labourers and their families —also known as "cortijeros". Cultural, economic and legal conditions and the total absence of any kind of hereditary aristocracy in the United States militated against the development of a feudal or manorial land-owning system other than in parts of Virginia, the Carolina Low Country, the Mississippi Delta, and the Hudson River Valley in the early years of the republic. Even these exceptions did not produce the social and economic structures or the extravagant manor houses found in Europe. In the American South, the use of slaves for estate labor was another important distinction between the American and European models of agricultural estates. The only manor house in the United States (or North America for that matter) that resembled the form and function of a European-style estate and manor is the Biltmore Estate in North Carolina (which is still owned by descendents of the original builder, a member of the Vanderbilt family). Most manor-style homes in the US were built merely as country retreats for wealthy industrialists in the late 19th and early 20th century and had little agricultural, administrative or political function. Today, many historically and architecturally significant manor houses in the United States are museums. Virginia House is a former sixteenth century English manor house blending three romantic English Tudor designs. In 1925, it was relocated to Richmond, Virginia from main sections dating from the 1620 remodeling of a priory in Warwickshire, England and reconstructed on a hillside overlooking the James River in Windsor Farms. Virginia House is now owned and operated by the Virginia Historical Society. When the interior was re-designed by it owners Alexander and Virginia Weddell, it became a home modern for its time with central heat, seven full baths, an up-to-date kitchen, and large closets. The almost eight acres of gardens and grounds on which Virginia House rests were designed by Charles Gillette. The house has been preserved and is largely as it was when the Weddells lived there. Virginia House is on the National Register of Historic Places listings in Richmond, Virginia. ^ "Borgen in Groningen". Groningen (in Dutch). Retrieved 30 June 2018. ^ "Virginia House | Virginia Historical Society". www.vahistorical.org. Retrieved 3 November 2017. Spiers, Richard Phené (1911). "Manor-house" . Encyclopædia Britannica. 17 (11th ed.). Timelines TV Interactive video timeline of British history with section on medieval manors. Estonian Manors Portal – the English version gives the brief overview of 438 best preserved manor houses in Estonia. Portal of Association of Latvia's castles, palaces and manors – the English version gives the information about all manors and castles in Latvia, routes and photos.